November 11, 2017 – Raiders 27, Dolphins 24 – In this episode, we talk about the Dolphins’ loss against the Oakland Raiders. In addition, we talk latest Dolphins injury news, our Fins Up and Fins Down, and our Keys to the Game against the Panthers on Monday night. Go FINS! 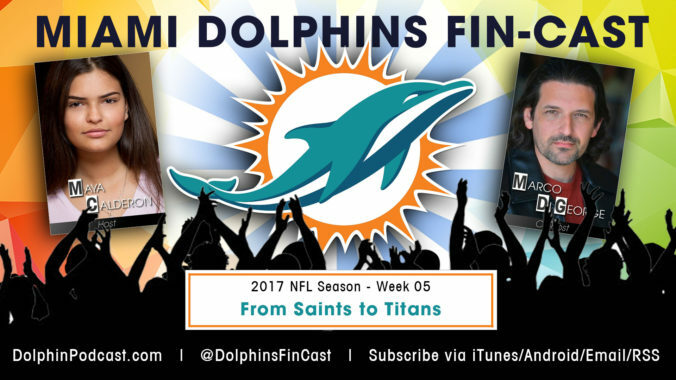 October 4, 2017 – Saints 20, Dolphins 0 – In this episode, we talk about the Dolphins’ shutout loss to the New Orleans Saints. In addition, we talk latest Dolphins news, NFL news, review the NFL scores for Week 4, and give you our Picks of the Week, where we run through our thoughts for every game in Week 5. Go FINS! September 27, 2017 – Dolphins 6, Jets 20 – In this episode, we talk about the Dolphins’ horrendous loss to the NY Jets. In addition, we talk latest Dolphins news, NFL news (including our take on the player protests), review the NFL scores for Week 3, and give you our Picks of the Week, where we run through our thoughts for every game in Week 4. Go FINS! September 14, 2017 – Let the Dolphins’ season begin!!! In this episode, we talk about the effects of Hurricane Irma and the delay of Dolphins’ season. In addition, we review the NFL Scores and Standings, and give you our Picks of the Week, where we run through our thoughts for every game in Week 2. Go FINS!